WSTFCURE.org - WORLDWIDE SYRINGOMYELIA & CHIARI TASK FORCE INC. Established on September 23, 2014, Worldwide Syringomyelia & Chiari Task Force Inc. is a non-profit 501c3 organization founded by a registered nurse living with Syringomyelia. We are a worldwide patient support organization led by medical professionals for people living with Syringomyelia, Chiari, and their complications. Our mission is to provide targeted education to empower patients and medical professionals to support continued learning about Syringomyelia and Chiari Malformation; how they affect body systems, the symptoms that can present, and the conditions that can accompany them to promote patient safety, enhance ongoing care and support excellent patient outcomes. Our focus is to deliver up to date educational sessions about the symptoms of spinal cord, spinal nerve compression/injury, and brainstem compression to all medical disciplines, educators, and patients touched by Syringomyelia and Chiari. Each affected body system can provide important assessment clues and we accomplish education through educational video segments, HIPAA compliant appointments, educational social media publications, and delivery of peer to peer inservices taught by registered nurses. We provide our members, families, medical professionals, students, and teachers with excellent resources to navigate Syringomyelia and Chiari with emphasis on collaboration and continuity of care across all medical specialties led by primary care and neurosurgery. We utilize comprehensive head to toe patient-centered customized approaches to determine educational tools and resources relevant to support the individual in their journey. Overall, our desire is to increase understanding about Syringomyelia and Chiari across all medical disciplines, encourage the addition of educational materials into school systems to support students and healthcare professionals attending school, and educate the public to improve the quality of life of the individual living with Syringomyelia and Chiari Malformation. We strongly encourage continuous updated education to promote excellent ongoing direct medical care throughout the lifespan to improve patient outcomes, and help save lives! If you or a member of your family has Syringomyelia, Syringobulbia, or Chiari Malformation with any potential co-existing complications such as intracranial hypertension, papilledema, central or obstructive sleep apnea, cranial nerve damage, spinal cord damage, spinal nerve damage, traumatic brain injury, compression of the brain stem, scoliosis, kyphosis, tarlov cysts (also termed perineural cysts), autonomic dysfunction, spinal fluid leak, paralysis, tethered cord syndrome, meningitis, or arachnoiditis you are invited to join us. 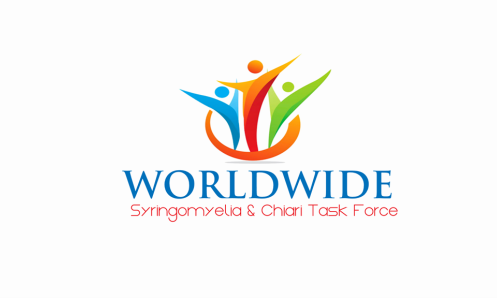 If you are an educator or a medical professional interested in learning more about Syringomyelia, Syringobulbia, or Chiari Malformation we invite you to become a member of Worldwide Syringomyelia & Chiari Task Force. Building our membership and working towards the launch of our worldwide patient registry encourages medical professionals, teachers, students, families, and researchers because they are able to visualize the rapid growth of a strong empowered network of individuals they may be able to help to move towards better understanding of the day to day challenges and complex symptoms; aid in new clinical trials, protocol development, and therapies to address multiple existing unmet needs and help save lives. Educational needs are vast and understanding the day to day symptoms and experiences of our members is helpful to focus in on development of comprehensive targeted educational tools to improve direct medical care. Outreach to establish educational programs to support continued learning in the medical field and classes in the school systems will foster success for upcoming healthcare professionals who will care for future generations. Membership also provides ongoing support and benefits to you and your family to promote quality of life and prevention of complications. We empower you with resources and a comprehensive customized plan relevant to concerns you may have when you are first diagnosed and when navigating through care and treatment for Syringomyelia and Chiari. Membership Benefits Include: Unlimited access to our 24 hour online closed member support groups moderated by registered nurses where you can share with others worldwide living with your condition; one on one sessions with WSCTF staff to provide you with relevant resources to empower you in your journey; unlimited HIPAA compliant education appointments available to you, your family, and medical team or educators to provide targeted tools and resources focused on Syringomyelia, Syringobulbia, and Chiari Malformation; publishing opportunities with our partners, a member spotlight on our website; support and opportunities through our partnership with the National Organization for Rare Disorders; interview/media opportunities; priority notifications regarding upcoming conferences, events; and registry updates; opportunities for free medical flights through our partnership with PALS; priority information about applying and connecting to Canine Companions for Independence; provider opportunities for medical publishing through NORD; and up to date information about genetic testing services and resources through Rare Genomics. We encourage all of our members to consider a contribution to support these efforts because we need help to meet our expenses to continue our educational outreach and programs. We understand that each of you face numerous challenges and we thank you for any help you can provide. We are a family and every life is precious to our growing team! Begin your membership today! Please fill out our form below, and then our Founder and Executive Director will be in touch to welcome you personally! Please indicate the time of day you prefer to connect with a team member and we will set up a call via email for introductions. The mission of WSCTF is supported by charitable donations. Your Donations Make a Big Difference! Deliver updated educational resources to the medical community, school systems, & public. Provide our nurse educators the ability to deliver updated education to nurses and physicians about Syringomyelia & Chiari utilizing educational videos, social media, medical publications, seminars at medical conferences, conference calls, and peer to peer in-services within medical facilities. Support research to develop treatment protocols and care models to supplement and hopefully improve direct care for individuals affected by Syringomyelia, Chiari, and their complications. Develop comprehensive programs in schools, hospitals, and outlying medical clinics that will result in improved direct patient care, and excellent collaboration with continuity of care across all specialties in medicine for individuals all over the world who bravely battle Syringomyelia and Chiari on a daily basis. Your donation is made on a First Data Secure Server by Bank of America. A receipt will be emailed to you upon checkout. We accept donations from $1.00 and up! Thank you for your generosity!